Safety handles could be very interesting. This is the second time I am blogging an image of the safety handles on the MRT. Advertising on public transport is getting more and more creative, I swear. 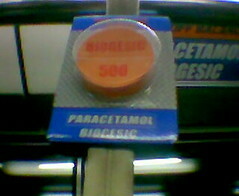 How could I forget that Biogesic is a pain reliever if I see it on the trainride on the way home? Hehehe. This makes commuting less boring indeed! Yes, that IS very creative. i saw this also…kinda cute..the ad alone relieves pain you get in the sardine-like mrt..haha..